As florists, there is nothing we love more than a creative brief. 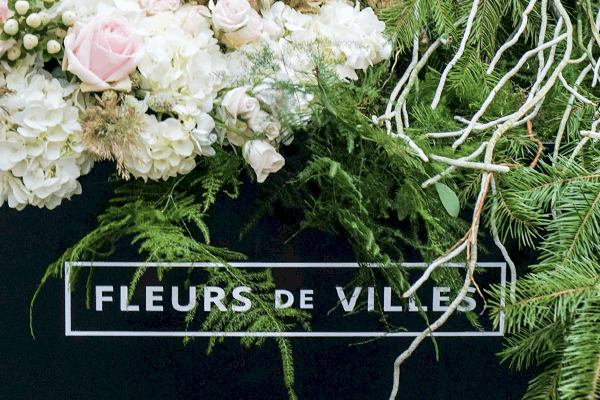 When Fleurs de Villes got in touch with us a few weeks ago, we knew it was a creative brief too special to pass up or turn down. The application involved a letter to Fleurs de Villes, a sketch and a brief about our brand/business and we knew we’d be able to create something incredible. As a small, local business we’re always looking for ways to challenge ourselves, and this was the perfect chance to do just that. 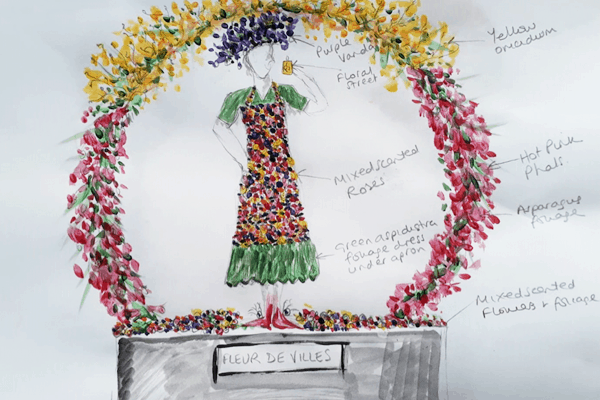 To creative a floral couture outfit, dressed on a mannequin, in partner with the perfume brand Floral Street. The design would stand alongside other incredible Uk florists inside the central market of Covent Garden – one of London’s most iconic landmarks. The chance for a small Essex-Village florist to display in the world-famous Covent Garden… How could we say no? The opportunity was something that got everyone excited, and we dived into the designing process almost immediately. We discussed colours, textures, patterns and shapes – and took a look at their past designs and past shows for inspiration. 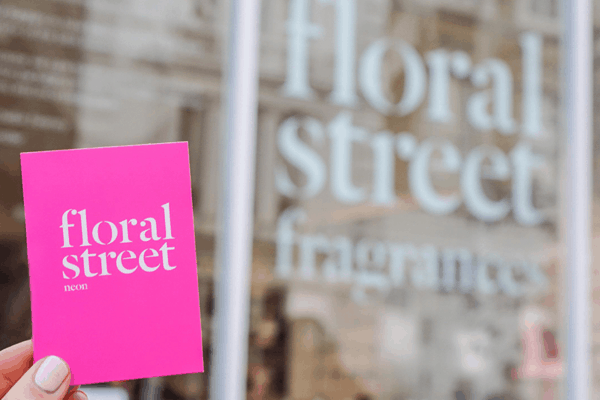 The brand we were partnered with, Floral Street, had to inspire the design in some way, so we knew that getting to know their team, and visiting their store would be really important too. We took a trip to London to meet with Michelle, their MD, and were given a tour of the shop and the products. We were greeted by a rainbow of flowers in the store (their floor is a multicoloured floral design!) and from this point we know our design had to be bright, bold and uplifting. We sat with the Floral Street marketing team and hashed out exciting designs, sketches, and bounced ideas off each other – what a fun way to spend the day! We decided to promote their colourful floral apron worn by al staff in Floral Street and identifying their brand. The next week of so was full of anticipation and excitement. 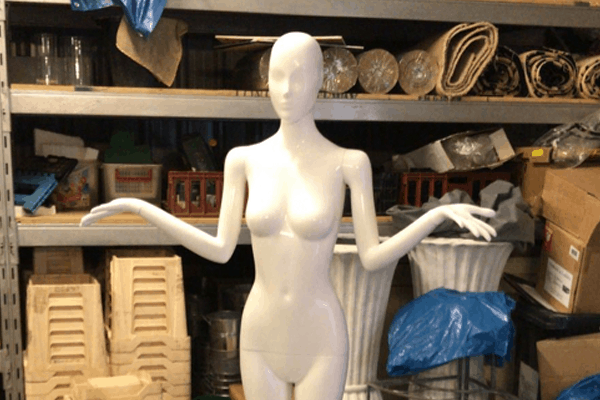 Waiting for our mannequin was like waiting for Christmas morning – we didn’t know yet what shape she would be in, or exactly how the design would come together. But then she got delivered, and her pose and stance was perfect – we could already see the design coming together in our imagination. The design team worked behind the scenes to carefully select the sweetest smelling roses, vibrant orchids and deep scented foliage for our design. We wanted the dress to not only look incredible but smell incredible too. We wanted people to stop and stare, and then stop and smell too! We chose the flowers that suited the Floral Street scents best too, as we wanted our mannequin to be a visual representation of the brand and the beautifully-smelling professional women who wear the scents. 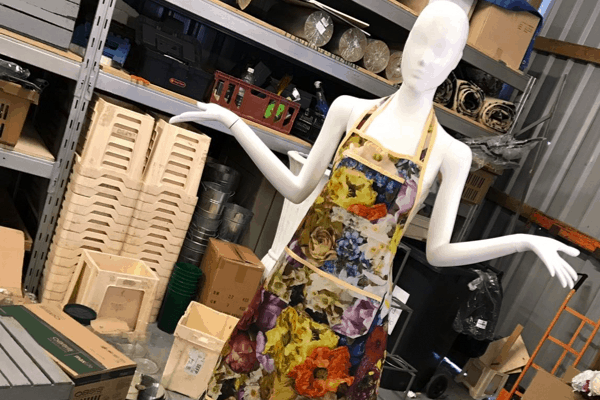 The first step when designing her, was making the skirt for her out of canes and chicken wire, using a local ironmonger to help build a frame. Flowers weigh a lot, and we knew we wanted a lot of flowers in our design, so keeping the design structurally safe and secure was a major concern. We worked so hard to ensure she not only looked fantastic, but was strong and sturdy too. Once the structure was in place, the fun began…. And the whole thing took 3 days to construct. What an incredible feeling to see something come to life in front of your eyes, and as each flower was placed – more and more personality shone through. She was going to be magnificent! Stay tuned to read about the event itself and how we constructed our design in the middle of Covent Garden!